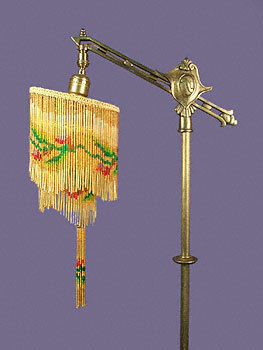 This is a magnificent Rembrandt bridge lamp from the 1920's. Made at the beginning of the Art Deco era, it displays design traits from both the Art Nouveau and Art Deco periods. The lamp measures 55" high, and stands atop a 10" round base. As with the AMBER FISHBOWL / PLANTER AND METAL STAND - item 2337, and the REMBRANDT BRIDGE LAMP - item 2336, this piece has been professionally refinished by the same craftsman in a beautiful array of period colors. The glass beaded shade that adorns this gorgeous lamp is a hand-made reproduction based on the lamps original shade. It measures 6" diameter, is 8-1/2" high, and has a 6-1/2" pull attached. This surely is a rare example of such a fantastic period lamp.